Once in a while, a meal is so complete, so thoroughly enjoyable, so reaffirming in its balance of elegance, creativity, and warmth, that it reminds you exactly what makes dining out such a treat and, in times like these, such an emotional necessity. I had an experience like that this past February at Mix, the fabulous restaurant at the top of THEhotel, next to the Mandalay Bay in Las Vegas. For my last night in town (coincidentally my birthday), my wife had flown out to join me for a special dinner. I’d been in Vegas all week hosting the culinary demonstrations at the Catersource and Event Solutions Conference and Trade Show, the largest gathering of its kind in the world, and this meal was to be the capstone on the week. It also was a chance to reunite with a good friend of ours, Christophe Tassan, who we’d gotten to know in Philadelphia when he worked as the Sommelier and General Manager of the legendary Le Bec-Fin, and who now is the Wine Director at Mix. He’s also one of the single most knowledgeable wine experts I know, blending a deep knowledge and understanding with an infectious enthusiasm that’s impossible not to get swept up in. So, just to reiterate: I was already in Las Vegas for work, but my wife had flown across the country for a single meal (we found a cheap flight…gotta love Southwest!). If ever there was pressure on a dining experience to be great, this was it: Hours on a cramped airplane, with only a single night out providing the light at the end of that long tunnel, tends to amplify expectations. Put simply, we were not let down. In fact, quite the opposite happened: This proved to be one of the best dining experiences we’ve ever had. Upon stepping off the elevator at the top of THEhotel, we were greeted by a shimmering sea of whites and creams; a gargantuan chandelier that, despite its size and its composition of 15,000 Murano glass balls made to look like Champagne bubbles, managed to appear almost impossibly light; and the best views in the city. As for the food, it more than lived up to the surroundings in which it was enjoyed, blending brilliantly defined flavors, a sense of luxury, and just the slightest touch of whimsy. The dishes on the Grand Tasting Menu, regardless of their individual ingredients, all struck perfectly balanced poses that highlighted both richness and a stunning sense of restraint. The highlights were too numerous to include in their entirety: Kampachi sashimi was the texture of silk and the perfect in situ argument for allowing top-notch ingredients to speak for themselves; seared Thai snapper with a carrot fondant and a tagine jus embodied everything that's great about dishes that pull from numerous cultures to create something new and deeply satisfying; roasted Maine lobster “au curry” with coconut basmati rice utilized its ambrosial perfume as well as it velvety flavors and textures to create a unified, gently aromatic whole; impossibly tender Colorado lamb loin was paired with miniature samosas whose own sense of spice cast the earthiness of the meat into exquisitely sharp relief. The list goes on. And all of these dishes were made even better by Mr. Tassan’s wine pairings. From the fantastic Herman Story “Tomboy,” a white Rhone-style stunner from Santa Maria, to one of the most complete wines I’ve ever tasted, the Zind-Humbrecht Pinot Gris Rangen de Thann Clos St.-Urbain 1996, the procession of glasses demonstrated exactly what has always made Mr. Tassan one of the best in the world: His pure love of wine from all over the planet, and his willingness to experiment with flavor and texture combinations, leading to pairings that surprise, delight, and, indeed, make you think. 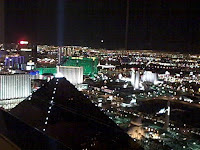 That theme carried through to dessert, too, when we were shown to our “dessert table” on the outdoor terrace 43 floors above the Strip. From the rich to the refreshing—the “floating island” was a standout—the selection of sweets, the planes taking off and landing in the distance, the spotlight shining up from the Luxor below...it all brought the meal to a perfect close. This was, without a doubt, an extraordinary meal, one of the best I've ever had. Indeed, it was an experience worth flying across the country for. Great food, spectacular wine, and being reunited with an old friend you haven’t seen in a long time: There’s just nothing better. For the past couple of months, Uncork Life! 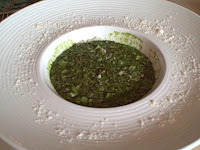 has been updated several times a week with wine reviews, accounts of great meals, videos, and more. Now you have the chance to get all the news—albeit in shorter form—even more often. Go to Twitter and sign up to follow “WineUpdate” for regular posts from all over the wine world. Then visit UncorkLife.com for full write-ups, videos, and even more in-depth coverage. We are working to become your one-stop source for the best that the world of wine has to offer. 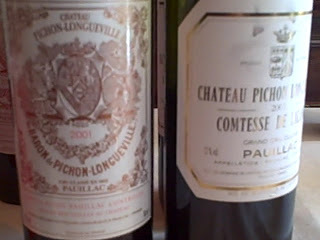 Right now, I’m on my way up to New York for a tasting of Chateau Pichon-Baron (the grand vin is officially called Chateau Longueville au Baron de Pichon-Longueville) and Chateau Pichon-Lalande (officially Chateau Pichon-Longueville, Comtesse de Lalande). 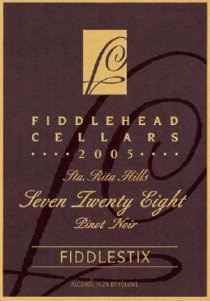 Quite a mouthful, to be sure, but so are the wines—both renowned and highly-sought-after Second Growths. I’ll be tasting side-by-side examples from both chateaux’s 2006, 2005, 2004, 2003, 2002, 2001, and 2000 vintages, as well as Pichon-Lalande 1989, 1985, and 1975, and Pichon-Baron 1990 and 1985. Check back here later this week for a full accounting and video of the wines, and follow the updates on Twitter today as I post live from the restaurant. Smoky oak and vanilla aromas are exuberant but kept well in check, and grilled graphite, red plums, a touch of chocolate, and even a hint of sesame seeds mingle effortlessly in the glass. All that silkiness of the nose is echoed on the palate, with a hint of caramel and a chocolate-covered-wafer note. The fruit, however, is more restrained than you’d expect, which works in the wine’s favor. It’s still young—I’d lay it down for 3 – 5 years—but the minerality of the mid-palate and the spiciness on the front-end of the finish promise a fascinating, rewarding evolution ahead. For now, I’d either drink it with food or give the oak and alcohol a bit of time to integrate. The wait, however, will definitely be worth it. 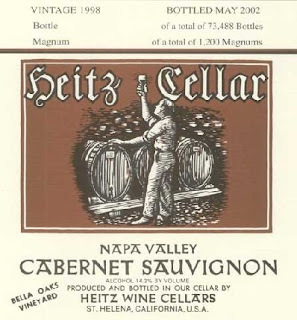 Cabernet Sauvignon (59%), Merlot (10%), Petite Verdot (8%), Syrah (8%), Cabernet Franc (7%), Petite Sirah (6%), and Tannat (2%). Click here for the 2005. A major earthquake hit Italy two weeks ago today. 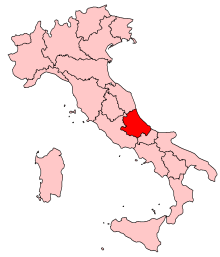 It was centered in the Abruzzo region, home to some of the easiest drinking, most readily enjoyable wines in the country. (Wine Spectator published an excellent piece about it on their web site the day after it occurred; click here to read it.) And while the recovery will take a long time, I’m doing what little I can to help out the people of Abruzzo by purchasing wines from there, cooking up some nice meals, and enjoying them as they were meant to be. This isn’t out of the ordinary for me: I drink a lot of Montepulciano d’Abruzzo for both its wonderful food-friendliness and its absolutely charming character on its own. But now, there’s an extra incentive, a human incentive. And not only am I making it a point to buy wines from the region, but I am also raising my glass in a toast to the people who made the wine possible, and who are facing such hard times right now. Though the local wine industry seems to have escaped major harm, the people of the region have a long road ahead of them. Buying and opening a few bottles of Montepulciano d'Abruzzo seems like an appropriate way to recognize the tragedy, and to do a little bit to help from this side of the ocean. Earlier this week, I had the chance to taste a dozen wines from Hendry with Susan Ridley, George Hendry’s partner, and Laura Lamprecht of Specialty Wines and Liquors, their distributor here in the northeast. Of those wines, the Zinfandel lineup was among the most fascinating. Each bottling is sourced from particular blocks and specific clones within the vineyard, which affords Hendry the unique opportunity to express not only the differences in terroir on the vineyard, but also the surprisingly varied characteristics of each clone. My tasting notes are below, after the video. But before reading them, take a look at Susan describing what exactly it was that I tasted. 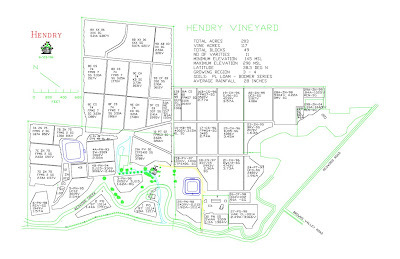 The Hendry "Block 7 and 22" 2005 was, as Susan described, exceptionally elegant. She called it a “Pinot Noir-lovers” Zinfandel, and she was right on the money: It was far more restrained than many Zinfandels, and possessed a lovely herbal note that came out especially well after having tasted the other Zins. The "Block 28" 2005, on the other hand, showed a significantly darker, richer berry note, and a palate that was buttressed by tannins that, despite their excellent integration, possessed a great deal more grip. The flavors ran the gamut from ripe dark berries and kirsch to licorice, and really called out for hearty, meaty food to enjoy alongside it. The Primitivo "Block 24" 2006 had a creamy, velvety, almost melted texture, and despite all the pronounced fruit of the nose, it tasted far more restrained and minerally than I’d expected, finishing on notes of graphite and baker’s chocolate. As Susan said, it was, simply, "yummy." 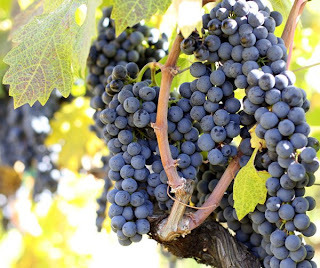 More and more producers are making the most out of the range of characteristics that Zinfandel offers. I cannot state strongly enough how important it is to taste a number of wines like these next to each other. It’s one of the best ways to wrap your mind around a specific grape’s—and vineyard’s—possibilities and pleasures. More often than not, my dinner choices are determined by what wines I’ve tasted that day (assuming I’m not visiting a restaurant or teaching a wine class). Last night was no different. I spent the entire day operating under the (perhaps foolish) assumption that I would be eating healthy for dinner. I had gazpacho in mind, perhaps some homemade guacamole—that sort of light fare. 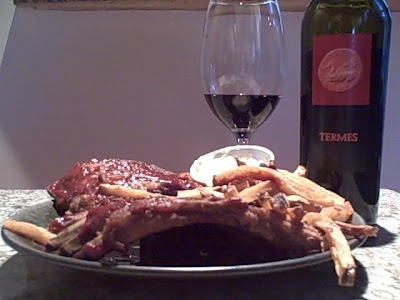 But then I tasted the Termes 2006, and all of my healthy-living plans went out the window. As I noted on my tasting video yesterday, the wine screamed out for something grilled, something barbecued. So as soon as I finished posting the video, I hopped in the car, drove to my favorite bar, and ordered their baby back rib special. The pairing was perfect: The charred bits of meat brought out the smokiness in the wine, the sweet – spicy barbecue sauce interacted beautifully with the wine’s rich, chewy fruit, and the tannic structure of the Termes stood up to the hearty meal with no problem at all. So perhaps, as the cliché goes, my best laid plans were laid to waste. But the reality of the evening was too darn tasty to argue with. Toro, west of Ribera del Duero and well southwest of Rioja, is one of the most exciting regions in Spain. In the video below, I taste the Bodega Numanthia-Termes Toro Termes 2006, a big, beautifully crafted wine that's not only magnificent now, but also promises several years of evolution...if you have the patience. Roero Arneis is one of those far-too-unheralded grapes whose time is finally due: Widespread recognition has been too long in coming, especially considering the many pleasures it offers at generally reasonable prices. 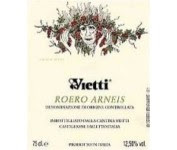 Last winter, before sitting down to a Vietti wine lunch at New York’s Grayz restaurant, I enjoyed the producer’s Roero Arneis 2007, which was not only a great aperitif, but also fantastic with the entire range of hors d’oeuvres on offer. It started off with aromas of melon and a soft flowery perfume held in check by a distinct minerality on the nose. Sip after sip featured addictive orange-pith notes that were carried by a surprisingly lively texture. One of the other attendees described its mouthfeel as “edgy,” and I’d have to agree: It practically danced on the tongue. Too bad more people don’t drink Roero Arneis on a regular basis—they’re missing out on one of the most easily enjoyable pleasures of Italy’s Piedmont region. In matters of taste, there’s nothing more important than the sense of smell. Wine lovers have known this forever: The lip of a good wine glass that’s narrower than the widest part of the bowl, the swirling, the sniffing—it’s all done in order to enhance a wine’s smell, and, therefore, its flavor. These days, the same attention is being paid to spirits, too—at least in the right hands. We’re not talking about bathtub-sized, quintuple-distilled vodka martinis here, but cocktails that are crafted in such a way that their multiple layers of character all have the opportunity to shine through. Which, in the arithmetic of all things imbibed—be it wine or spirits or tea or coffee—equals more, and better, flavor. I recently sat down with Tom Pittakas, the Beverage Director at Alison two, Chef Alison Barshak’s fantastic follow-up restaurant to her successful and wildly popular Alison at Blue Bell in the suburbs of Philadelphia. Tom is one of the most careful, considerate, knowledgeable beverage professionals I know, and during the course of our conversation, he told me about a new technique he’s using at the restaurant’s bar. And though this one is obviously for spirits, the underlying principle is the same as it is for wine: Aroma is key. Rather than try to describe it, though, I’ll let Tom show you himself. After shooting, I tasted the cocktail, and was blown away by the careful interaction of flavors on my tongue and the persistent aroma that literally clung to the sides of the glass, enhancing the entire experience. The lesson is simple: In wine and spirits, as in everything we drink, focusing on smell is one of the surest paths to enjoyment and pleasure. 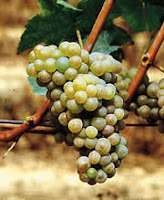 I talk about it all the time in my classes at the Wine School here in Philadelphia, but it bears repeating right here, too: Riesling is one of the most food-friendly wines around, yet too many people still don’t think of it enough when the time comes to select a wine to bring to the table. Riesling’s magnificent usefulness with food was driven home yet again at the Wine Media Guild’s Austrian Riesling lunch at New York’s Felidia this past Wednesday. The often bracing acidity, the wonderful minerality, the lively citrus character: Everything about the wines screamed out for the kind of deeply flavorful, springtime-bright dishes that were served that afternoon. Now, the dishes we enjoy at these monthly lunches are not paired with any specific bottlings. Rather, they are conceived in such a way that they will work well with the overall wine theme of the day. Beyond that, it’s up to those of us in attendance to mix and match and discover which wines pair best with which dishes, which is a heck of an education. This is a fantastic way to explore pairing theory in general, and to really get to know the specific wines from the tasting even better. The Knoll Riesling Federspiel 2007 (above left), for example, was excellent on its own, all minerality and bright citric acidity. But when sipped alongside the house-smoked salmon pastrami with red watercress and chive sauce, its pepperiness came right to the fore, though this was tempered by the spring-like freshness that the greens brought out in the wine. The Riesling's acid, too, was subdued a bit by the oil in the fish, making it impossible to stop eating the salmon or drinking the wine. Dangerously delicious, indeed. I also loved the spring quinoa “risotto” with spring vegetables and spinach puree ( right) with the Hirtzberger Riesling Smaragd Hochrain 2006. Sipped without food, the wine showed beautiful peach and apricot character and a bass-note of something almost woody and mushroomy. With the quinoa, a sense of earthiness came to define the combination, and cast both the wine and the food in a completely different and unexpected light. That’s one of the main virtues of tasting like this, and of experimenting with combinations that you might not have had or even thought of before: Discoveries abound, and excitement becomes the defining characteristic of the meal.